Born in 1932, accordionist / musical philosopher / teacher Oliveros has been hailed a champion of the avant garde in America, ever since instigating the field of meditative music. Founding the Deep Listening Band in 1980, she is responsible for a body of musical composition which explores meaning in ritual and myth, simultaneously tapping into the dramatic and theatrical aspects of the art world. Highly respected status in new music circles has subsidized a number of different projects of which this CD is the most recent. That is as far as release date goes anyway. 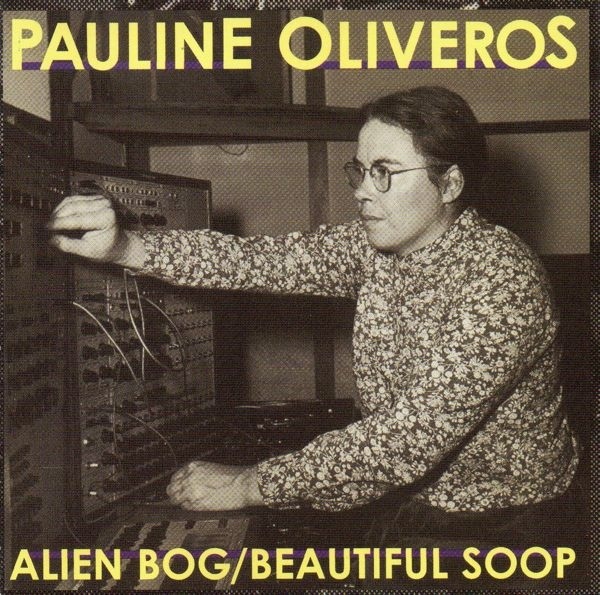 Don't expect any meditation however, as Alien Bog / Beautiful Soop portrays electronic music experiments from her late 60s teaching stint at Mills College. Created on that Mt. Rushmore of instruments: the Buchla modular synthesizer system, these two archival works predate the era of mass production — when a synthesizer was a one-of-kind laboratory piece, commanding the respect (and space!) that would be considered comical in a world where the beastly machines roll off assembly lines in the blink of an eye. As source material Oliveros here uses a series of contrasting low and high frequency waveshapes which constantly interweave with each other in a non-repetitive continuum. Despite its radical nature (i.e., no real melody or rhythm to speak of), there is still a tangible arching form which carries over, if ever so obliquely, as the shape of the music twists and bends on its wily course. Do not mistake this as sheer random noise. Rather the textural fluctuations and sound events are strictly patterned to move in a discreet direction. And yet while no stickers warn "Danger! Avant Garde Territory!" perhaps only the small legion of supporters of composers such as Subotnick, Stockhausen, et al. will find much to grasp onto. Clocking in at a good thirty minutes a go, a confrontation with one of these monsters can be like serving a prison sentence for anyone expecting Klaus Schulze. Especially on "Beautiful Soop," which for me was spoiled by narration. But if true innovation is your bag, then Oliveros' CD provides a 60-minute history lesson in an almost extinct compositional idiom.